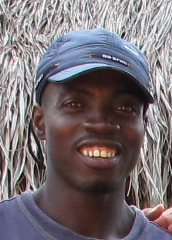 A dance and drumming performer as well as a teacher working at the Dagbe Center, Odartey acts as a pedagogical supervisor and organizer for the group: having contact to each individual student, putting the groups together, planning rehearsals and making sure practice processes are coordinated. During rehearsals he teaches the group from a rhythm section standpoint. Having years of experience in training the school’s cultural troupe, a group of students performing traditional dances, songs and drumming, Odartey monitors the overall educational process.